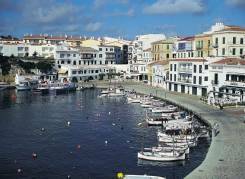 Binibeca and Binifsafua are pretty towns at the eastern end of the south coast of Menorca, and the first holiday resorts on the island. They are in a prime locations to enjoy a string of beautiful sandy bays, rocky coves and a very small inlet for boats all lapped by cool, clear water for refreshing swimming. Basically several little resorts. Binibeca Vell is similar to Portmeirion in Wales, brought to fame by the TV series ‘The Prisoner’. Binibeca Vell was designed by famous Catalan architect, Antonio Sintes, in the 70’s. Built to look like an old Mediterranean fishing village with a maze of narrow cobbled alleys, Moorish arches, whitewashed houses with sun-soaked patios, and a little harbour. It’s a quaint, quiet and laid-back place with shops, restaurants, bars and squash courts. 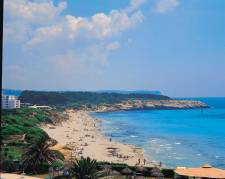 Binibeca Nou has a gorgeous, dune-backed, sandy beach with a pleasant beach bar and restaurant and sunbeds for an afternoon snooze. 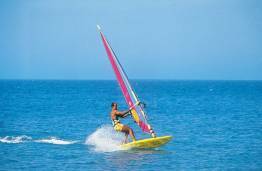 At Binibeca beach you can hire to hire sunloungers, parasols & pedallos. Food available at a shack. 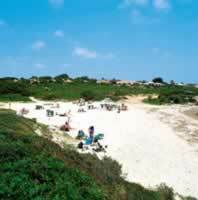 For the more active, there’s a diving centre and equally good swimming and snorkelling in the next bay at Binisfau. The road mini train to Punta Prima about 7km is a popular outing with little ones. Coastal Cala'n Porter can also offer a fascinating day out of the sun exploring the caves above the town, some of which house bars and clubs. Es Canutells is a small and cosy resort located on a hill above the dazzling coast.